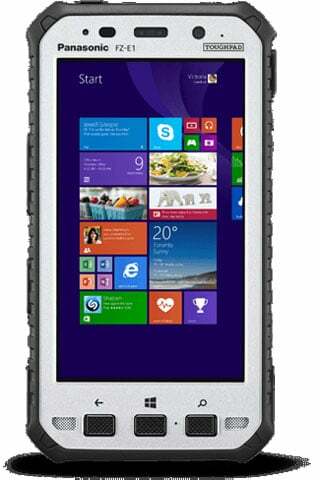 Panasonic Toughpad FZ-E1 - Wi-Fi (802.11a/b/g/n/ac), Tablet, Windows Embedded Handheld 8.1, Qualcomm MSM8974AB 2.3GHz Quad Core, 5" HD 10-pt Gloved Multi-touch, 2GB, 32GB, Bluetooth, 4G LTE AT & T/Verizon Micro SIM Slots (Voice/Data), Webcam, 8MP Camera, NFC, 2D Bar Laser (SE4750), Magstripe, Handstrap, Toughbook Preferred. Interface cables and charging cradle sold separately. AC Adapter (Part# CF-AA6373AM). Single slot charging cradle (Part# FZ-BCRD111). Quad slot charging cradle (Part# FZ-VEBX121M). The Panasonic FZ-E1BBCA1BM is also known as PAN-FZE1BBCA1BM	or FZE1BBCA1BM	.